Worldwide, at least 185 million people have been infected with hepatitis C virus (HCV), nearly three quarters of them in middle-income countries (MICs). Although hepatitis C can be easily treated and cured with oral drugs, over 700,000 people die from HCV-related complications each year. An estimated 30 million people need HCV treatment now, so they don’t progress to cirrhosis, liver failure or liver cancer. Access to HCV treatment is limited to nonexistent, especially in MICs, which are home to the majority of the world’s poorest people and 73% of all people with HCV. The pharmaceutical industry sees MICs as “emerging markets” and charges high prices there to increase their profits. Because government-funded health care in MICs is limited, most people must pay for HCV diagnostics, care and treatment out of pocket—and they cannot. Despite the urgent need for HCV treatment in MICs, Gilead Sciences—producer of HCV direct-acting antivirals (DAAs) — made agreements with 11 Indian generics producers that limit where their drugs can be sold. 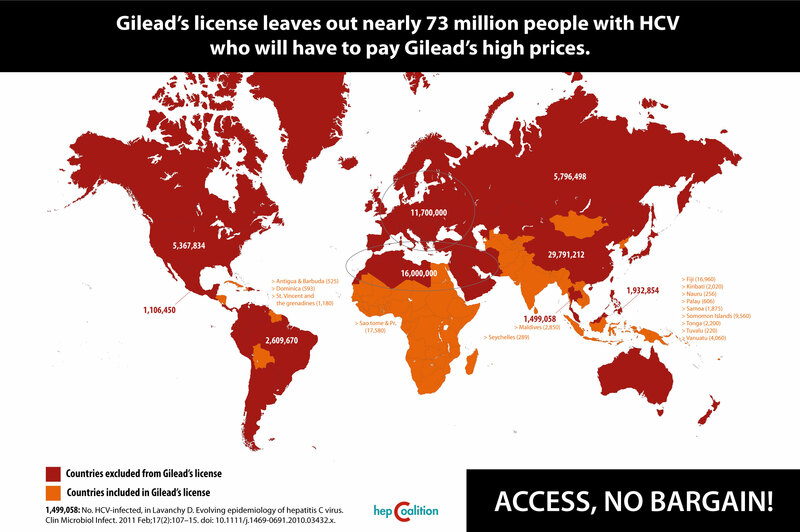 Gilead’s agreements prevent nearly half of the world’s people with HCV from being able to buy affordable generic versions of Gilead’s HCV treatment. Most of these are MICs, including China, which has the world’s highest number of people living with HCV (approximately 30 million) – and many other high-HCV burden MICs. These countries will be forced to pay whatever Gilead decides they should to cure their people. The MPP has not stated that it can significantly improve hepatitis C treatment access in middle-income countries, where it is needed most. By entering the “HCV space”, the MPP is endorsing voluntary licensing, which we believe is an industry-driven strategy to control markets—VLs allow pharmaceutical companies, not goverments and their people, to decide where affordable generic drugs are available. We believe that UNITAID and the MPP should focus on other strategies to provide access to HCV DAAs—and other life-saving medicines— in MICs, such as patent oppositions, law reform and other government-initiated measures to increase access. We believe that the MPP could jeopardize ongoing community-led approaches to create and support sustainable, local government HCV responses using patent oppositions, law reform and TRIPs flexibilities such as compulsory licensing to bring affordable generics to market and continue to lower prices through competition, as has happened with HIV antiretrovirals, where prices have dropped by 99% within a decade. It is essential to support community-driven, pro-public health and human rights, government-led approaches to sustainable access to affordable generic medications; not industry-driven ones. Equitable access to HCV drugs. Petition to stop Gilead’s anti-diversion program that violates physician and patient rights to protect its profit.